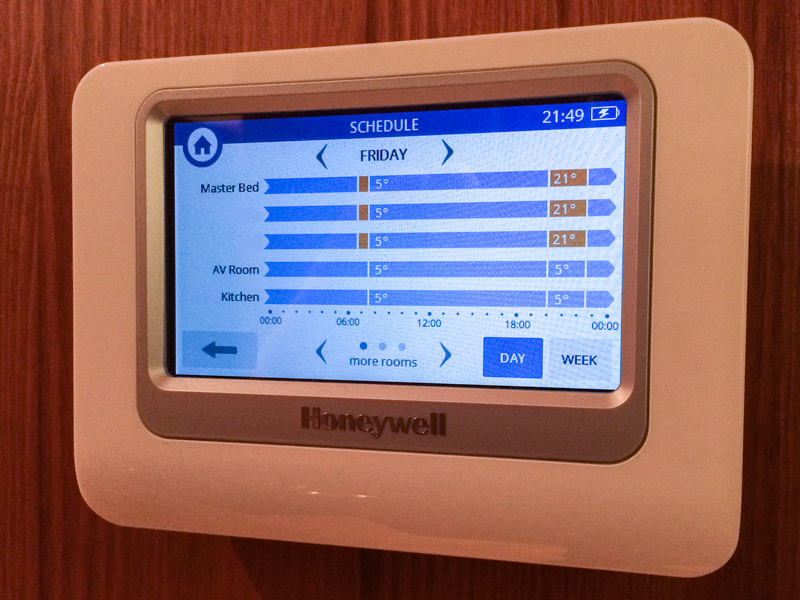 We took a look at the new Honeywell evohome when it was announced last Autumn, but there’s no substitute for living with a system to see what it’s really like. So when Honeywell asked us if we’d like to replace our HomeTronic system with the new evohome we jumped at the chance. To recap, this is the second generation evohome, now with a colour touchscreen instead of black and white. It can control up to 12 zones of heating plus hot water. A zone might be a simple as all your bedrooms, or you might like a zone for each individual room for more granular control. If you have several radiators in one room they can all operate together as a single zone too if you like (note you cannot currently have an underfloor circuit and a radiator together as a single zone). If you have more than 12 zones you can add another evoHome controller, perhaps one for upstairs and one for downstairs, if you live in Downton Abbey. Honeywell recommend using one of their approved installers and you can search here to find an Evo Installer near your postcode. Luckily all our existing wireless Honeywell kit was compatible with the new system. That meant our Wireless Relay Box (BDR91), Underfloor Heating Controller (HCE80 or HCC80) and Room Temperature Sensors (HCW82 or HCF82) were all retained. Our HR80 radiator controllers were swapped for the new HR92 models and the touchscreen controller was mounted on the wall. With the boiler and underfloor controls already fitted, the evohome touchscreen led us through the setup process with its Guided Installation. Just follow the prompts on the screen to setup the bindings with your wireless hardware. It’s worth noting that each battery operated device communicates according to predefined time slots to conserve power which means it can take up to a maximum of 4 minutes for some tasks to complete. You can give each zone a custom name using the touchscreen controller (9 character limit). It’s amazing how a few years of modern UI use spoil you and make you expect things like automatic title case or the ability to edit a character in the middle of a word rather than having to delete it all and start agin. But that’s nit picking, it’s an impressive little unit. HR80 Firmware version 2.03 and above has been tested and is supported to work with evohome. You can check the firmware version by removing and replacing the batteries in the HR80, or via the product label. Older firmware versions will offer core functionality with evohome, however in some versions they pre-date some of the more recent features such as optimization and window open, and these will not function as expected. The evohome controller’s resistive touchscreen is less sensitive than the more expensive capacitive screen you are probably used to on your mobile device but it’s adequate and the UI is fast and responsive with no lag. There’s a choice of 3 colours for the faceplate surround (black, white and silver) and choice of table stand or a wall mounting kit. Our controller is wall mounted in the kitchen, fairly central in the house and well within radio range of all the other rooms, as we already knew from our HomeTronic installation. You can use the built-in RF signal strength checker to find the best location to site your controller. There is no range extender available for this system, although Honeywell say that its relatively low-frequency (868 MHz) means better signal propagation than competing products using Zigbee or WiFi, and they quote a wireless range of around 30 to 40 metres in a typical residential setting. You can easily lift the controller off the wall mount (as you can with the desktop kit). After 30 minutes the evohome Controller will start to beep to remind you to place it back on charge. That could be annoying if you’ve just nodded off to sleep, but it’s important as the unit needs to be powered up to run your schedule. If the batteries ever do run completely flat in the controller the system parameters including schedule and wireless configuration are stored in non-volatile memory (replace the main batteries with AA 1.2V Ni-MH 2000- 2400mAh cells only). In practice, in our home, the evohome controller is only used to glance at the zones status and to edit the weekly schedule the very odd time. Apart from that manual adjustments are all made using our iPhones. There’s probably a case for Honeywell to consider an even cheaper starter kit that forgoes the touchscreen part of the control and relies solely on the apps to setup. You can choose between manually setting up your heating schedules or going with the ‘Wizard’. This guided step-by-step setup simplifies the task and you can still make your changes by editing the results at the end. You can copy scheduled set points from one room to another, or copy days across rooms etc. There are a few improvements that could be made to the UI. For example when tapping the up arrow to adjust the target temperature on the screen you cannot see the numbers changing as your finger is covering them. 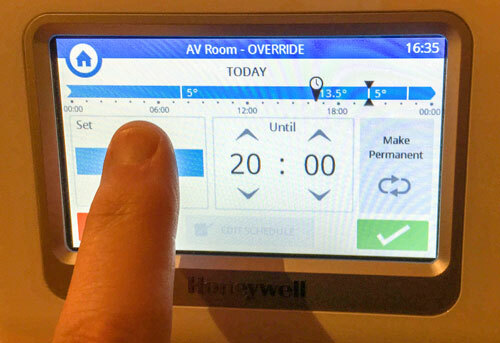 The evohome touchscreen unit itself can be used as a thermostat for the room it lives in. So if it was in a room with under floor heating for example you wouldn’t need a separate stat. Quick Actions allow you to, for example, turn temperatures down all throughout the home by 3 degrees with the Economy button. We’d like to see Honeywell add a way to save schedules say for each season – to save re-programming the schedules each winter. There are a variety of intelligent technologies such as “Optimum Start” and “Optimum Stop” which are employed so the system can reach a specific temperature by a specific time. Evohome works out a dynamic boiler start-up time based on the ambient temperature, so to reach say 22 degrees by 8:00pm it may start at 7:30pm today, but 7.40pm tomorrow if it’s warmer. Evohome also employs other technology to understand when a window is left open and throttle back the heat in that room rather than fight against it and waste energy. It also learns how your house heats up and cools down throughout the year. 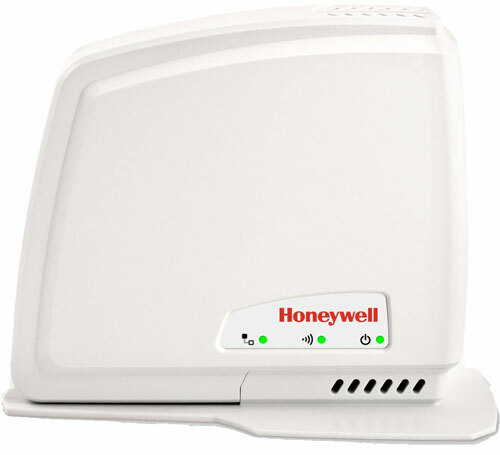 Honeywell posted some good technical info in our forums here on this topic. The rear of the unit has a couple of interesting ports. We’re told the headers labelled “Aux” are “currently not actively used” and the USB input is for firmware upgrades, although we don’t know if this can be carried out by the end-user. You can use this evohome simulator to give you an idea of how some of the screens work. The HR92 radiator controller will fit on most standard (M30 x 1.5) TRV bodies like Honeywell Braukmann, MNG, Heimeier and Oventrop. They come with a Danfoss RA valve adapter included and others are available to order. Depending on your valve orientation your HR92 may end up vertical or horizontal. The large clear blue backlit display flips up and included in the box is a little plastic wedge that can be fitted to lock it in the up position if you prefer. You can use the adjustment dial to manual request a new target temperature which is in effect until the next set-point in your schedule is reached. These manual changes are not reported back to the main controller or apps. With the old HR80’s we used to spin the dial several times without looking at the display and walk away knowing it would be at the bottom 5 degree value and turn off. However if you do this on the new HR92’s you reach an ‘OFF’ position instead. The unit then ignores schedule changes from the evohome controller from then on (although frost protection is still enabled). That might catch some people out at the start and we’d have preferred it if it wasn’t quite so easy to turn the radiator controller Off like this. Pressing the single button on the HR92 brings on the backlight. Pressing again and holding for around 5 seconds takes you to the top-level of the settings menu. Here you can disable the backlight, set the language, whether you prefer to display the setpoint (target temperature) or the actual room temp. You can add a Honeywell DT92E Wireless Digital Room Thermostat if required too although the HR92’s fuzzy logic is programmed to work out an accurate room temp despite being attached to the rad. The two (included) alkaline AA cells (LR6, AM3) are cleverly integrated into the new barrel design of the valve controller giving it a much more svelte silhouette than the older unit. Lithium and NiMH cells can be used (you’ll need to let the valve know this by modifying the battery parameter 9) and Honeywell say the batteries should last around 2 years in average usage. This seems entirely achievable judging from our experience so far. 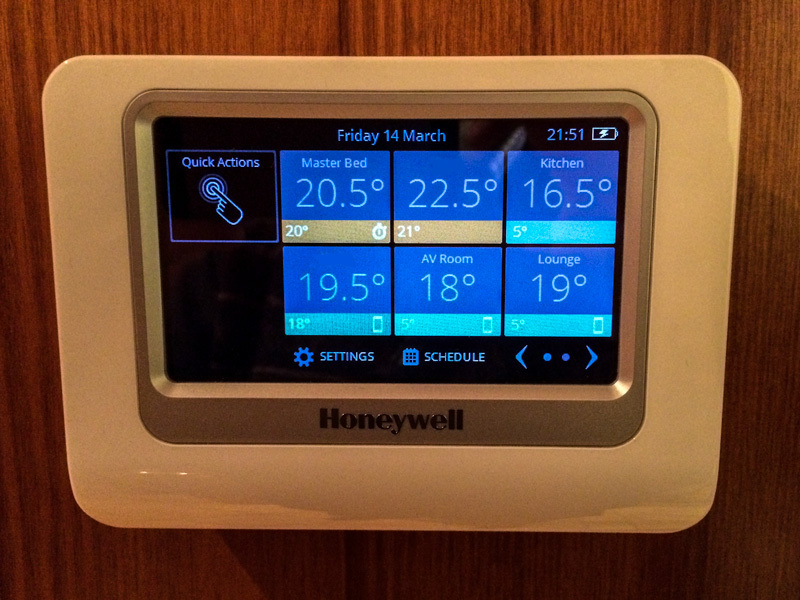 As well as controlling 12 zones of central heating, evohome will look after your hot water too. We have an oil fired stove in the kitchen so there’s always hot water, but if you need to add it to the system then the Hot Water kit is available at around £90. Joining your new wireless heating controls to your LAN and the Internet is done with the shark-fin-shaped remote access gateway. With its supplied Ethernet cable connect the box to your router or a CAT5 outlet in your flood-wired smart home. Then connect it to the mains with the supplied wall-wart power adapter, and then bind it to the rest of the wireless system. To complete the install you need to setup an online account and although it wouldn’t accept my postcode from the mobile app it worked fine from our laptop. Once you have the remote access gateway installed you can control your evohome from the mobile apps. They are available for iOS and Android so controlling your home heating from your iPhone, iPad, Samsung Galaxy, Nexus tablet or whatever is suddenly a magnificent reality. The convenience of control from your pocket cannot be under estimated. The app has had a couple of updates since release and now has the ability to edit your schedule from your phone (Version: 2.1.13.5 reviewed), although there’s still currently no iPad version to take advantage of a bigger mobile screen. The app allows you to monitor and control multiple locations, handy if you have a system at your holiday home too. There’s still no web browser interface to the system yet either. Editing schedules in particular would be ideally suited to the extra screen real estate of our laptops browser. While we’re pretty certain it’s only a matter of time before Honeywell add this feature officially, some enterprising individuals have already got it working. Check out all the details in this post on our heating control forum where Automated Home readers have used Python, PHP and C# to create a representation of the evohome controller in a browser window, whilst integrating with other smart home systems like lighting too. We have already released APIs for selected partners (e.g. OPower).We will continue to work closely with selected market partners first to ensure that our APIs are functioning correctly before opening them to larger groups of developers. In the meantime you can connect your Netatmo Weather Station to your system and also trigger actions based on geofences with the IFTTT evohome channel. You can tell that Honeywell are several generations into these systems. It’s taken the solid foundation of the first gen evohome, and the even more mature wireless technology of its HomeTronic predecessor and built on that. The visual leap from the old HR80 valve controller to the sleek new HR92 tells you all you need to know about the progress here at a glance. When you buy a system like this one that’s reliant on a 3rd party cloud based service there is some risk involved. What if the company goes out of business? what happens to your hardware investment then? While there are dozens of startups entering this space right now you’d be hard pushed to find a bigger global HVAC player than Honeywell so we recon it’s probably the one you’d have to worry about least in this respect. The Honeywell system is sophisticated yet it simplifies a task that for most of us is the un-welcomed rigmarole of stabbing buttons in a never-ending tangled menu hierarchy. It brings heating control into the age of beautiful smartphone UI’s and creates the ‘User Experience’ we all crave. If you are currently the sort of user that turns your entire household heating all on, or all off (would you do that with all your lights?) then evohome will definitely save you money. How much is definitely a ‘how long is a piece of string’ question, but for us it was significant. The savings aren’t merely a result of the smart tech and algorithms employed for better efficiency, but just the mere fact that control is so simple makes it much more likely you’ll change things and save. Honeywell say “82% of energy consumed in the home is used by heating and hot water.” In a non-scientific guesstimate we’d say moving to a zoned heating system saved us around 20% on our annual heating bill. We’ve use 4 or 5 fills of heating oil per year averaging around £500 each in recent times so a saving of around £400 to £500 per year is not out of the question in our setting. With energy prices on a seemingly never-ending upward spiral payback times for heating controls are continually improving. In addition to the financial case there is also the convenience factor to consider, and it’s immense. Once you start controlling your heating from your pocket you’ll wonder how you ever did it the old way. Controlling your heating from anywhere in the world is a feature that’s often requested by smart home owners. It’s usually available as an add-on product that can have a significant cost on its own, but it’s included in the price here. You can check out the online evohome system builder to give you an idea of what to order for your home and an estimate of what it will cost. The last couple of years have seen a huge influx of new smart home heating controls. But we can’t help feeling the evohome is a premium product in this market, but without the usual accompanying premium price. We especially like the fact that you can get into evohome for around £200, starting off with the ATP921G2080 Evohome Base Pack (Honeywell Evohome controller, Power lead / table top stand and BDR91 Wireless Relay box) then add the radiator controllers as you can afford them, to building your complete system. One thing’s for sure, after living with evohome for just a few months, it’s hard to imagine ever going back. 15 Comments on "Review: Honeywell evohome Wireless Smart Home Heating Controls"
We had the Evohome system installed in August but now the colder weather has arrived we are feeling the benefits. I love the fact that I can programme each room to different times and temperatures although I still haven’t totally cracked a ‘perfect schedule’. I originally just wanted a system that I could operate remotely but am really pleased that I went for the full zoning. I can confirm that Evohome is not just for large houses (as we were told by 2 companies that came out to quote for install) – ours is a 2 bed bungalow. This kit looks pretty good. Has anyone done a comparison with the Lightwaverf one? The Honeywell setup looks like it could be more expensive as the cost per TRV is higher. If the cost of TRVs could drop to below £30 then far more folk would go for these systems. It’s hard to take the leap and spend upwards of a grand when it’s a speculative saving in the long term. Personally, I like the convenience of a system like this so I’m keen to buy one. My reluctance comes from the fact that tech prices drop so much so quickly (fingers crossed the TRVs follow suit). Reading the reviews on the Lightwaverf forum, there appears to be a lot of problems with their heating controls with users wanting to get rid. We have the lighting switches and sockets and have absolutely no problems but I am glad that I saw the Evo first as I would have been tempted to have just one system. I agree the cost is a big factor and it was only that I had saved some money up to ‘treat myself’ on something significant (I am not a shoe and handbag woman!) that I got my Evo. Installed this just last weekend. Unfortunately haven’t properly set it up yet so using it just as a dub device. The benefit and a disadvantage (kind of) is that we have to call out a plumber as half of our valves on the rads are not working so need to fix that first before fully installing the rad controllers. Overall the device looks very sleek and is a cool gadget that doesn’t make me regret the investment yet. Will see if it was economically sound in few months. I’m currently wavering between the Evohome system and Heat Genius – has anyone got experience of them both? I think what would finally swing this for me would be if the RFG100 just provided a web interface and was the center control for everyhting then I can just talk to that via my computer / tablet / phone / whatever. We just had this installed with zones in each room. It’s probably not very realistic of me to think that a schedule will be permanent because it’s also about how hot/cold you feel personally having come in or woken up. The scheduling allows you to set it at an approximate, but I tend to modify it on the go and needed. This level of quick control is one of the things I like. I like being able to set rooms up based on general habits in the home, so that once everyone is generally downstairs in the morning, there’s no need for heating on upstairs. At the same time, if we’re all out on the weekend, I can switch everything off and then turn it all back on remotely when we’re heading back. The controls are pretty easy and everyone has appreciated having a much more helpful way of being comfortable at home. Pricey to get going, but the financial benefits will be seen over the longer term and the practical benefits have been immediate. How much has everyone paid for installation of Evohome? i am being quoted £1,300 to fit the basepack and 4 radiator valves? Absolutely fantastic controls for heating system. We replaced a solid fuel boiler with an oil fired combi boiler but retained the original radiators. To be able to program every one of the 10 radiators (two in the lounge)in our house separately is amazing and energy saving. Each room is heated as and when reguired. To be able to adjust settings by use of our mobile when away from home in the winter keeps the house safe from freezing pipes in the cold weather of winter. We had a couple of issues. The original APP gave problems but the updated version we now have seems to work OK on our Sony Experia Mobile. The power supply for the Remote Gateway failed to come on after being switched off. It had to be left for several hours before it would work. I phoned Honeywell and they sent a replacement quickly and it seems to be OK. Very impressed with Honeywell response to these issues.The system was fitted in June 2014 by our heating engineer. He had not fitted one before and ours may have been the first in the Highlands. I had to work out the controls for myself and managed to. With time I have discovered several features that I did not realise existed when I bought it. There are settings which allow the thermostats to learn how long a room takes to heat up and cool down! It is VERY clever. Not cheap but very smart. Hope someone here can help me as the Honeywell representative hasn’t been much help. I want to install the evohome system and the central heating side seems pretty straight forward but I also want to control my hot water which is via a megaflo system, I was hoping I could purchase another relay box solely for the hot water to simply turn off and on without knowing the temp, would this work? but I’m under the impression I need the Honeywell hot water kit which comes with an insert sensor, my second question is will the insert sensor fit my megaflo system? Any advice would be greatfully appreciated. I have recently bought a property and have had a megaflow 250l tank and new valiant boiler installed. I went out and bought an Evo home base unit and hotwater kit. My plumber cannot get his head around how to install the sensor into the megaflow tank. Anyone have any instructions I can send him? I am planning to buy following items but 3 rooms has 2 radiators. You can have one HR92 per room. Adjust all other radiators to smaller setting on manual valves. The room temperature will be adjusted by one radiator with HR92. When temperatures outside will drop you will have to open manual radiators by hand. You have to follow that all radiators not having HR92 are set bellow HR92 set point. Otherwise HR92 will close the radiator.